Our reflectometers feature most accurate single beam reflectance measurements by height and tilt adjustment of sample and high light conductance of optical layout allow repeatable measurements of nand k, measurements on rough surfaces as well as thickness measurements of very thin films. The reflectometers RM 1000 and RM 2000 can optionally be equipped with an x‑y mapping stage and mapping software, objective lens for small spot size, and a video camera. 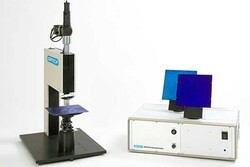 The spectroscopic reflectometers RM 1000 and RM 2000 measure reflectance of flat or curved samples with smooth or rough surface. Thickness, extinction coefficient, and refractive index of single films or layer stacks are calculated using SENTECH FTPadv Expert software. 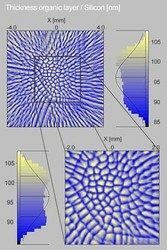 Single films between 5 nm and 50 µm thickness, layer stacks, and substrates can be analyzed in the UV‑VIS‑NIR spectral range. 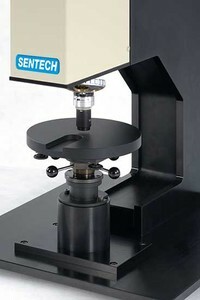 The RM 1000 and RM 2000 represent high end SENTECH reflectometers. 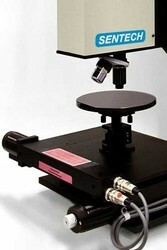 The table top device comprises the highly stabilized light source, the reflection optics with auto-collimating telescope and microscope, the height and tilt adjustable sample platform, the spectral photometer, and the power supply. It can be optionally equipped with an x‑y mapping stage and mapping software, objective lens for a second spot size, and a video camera. Besides film thickness and optical constants, the composition of films (e. g. of AlGaN on GaN, SiGe on Si), AR coating (e. g. on textured silicon solar cells, UV sensitive GaN devices), and coatings on small medical stents can be measured by our reflectometers. These reflectometers support applications in microelectronics, microsystems technology, optoelectronics, glass coatings, flat panel technology, life science, biotechnology, and others.